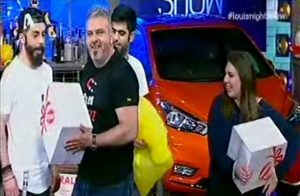 Objective: To promote our EUREKA products, MR BIN Garbage bags, ROKLIN multi surface cleaner, FAMOZO Glass cleaner and AROXOL moth repellent and coordinate a Product Placement Activation on Louis Night Show. We chose a comedy TV show with the highest ratings on local channels & high frequency, in order to gain the right & the highest possible exposure for our products. Description: To connect the successful TV show and its audience with the ‘traditional & established’ EUREKA brands. Through live interactions & competitions with the presenter of the show and his audience, we were giving our products as gifts to the winners. The products were exposed on stage throughout the show.